Samuel Morse revolutionized the field of geography by shrinking the world as we know it. In 1837, he submitted a patent for an invention he called the telegraph, a device which fundamentally changed the way spaces interact with each other. Essentially creating the first system for rapid, long-distance communication, Morse innovated how people talk to each other, and greatly increased the discourse one could have over a larger area. His system of dots and dashes later became known as Morse code. 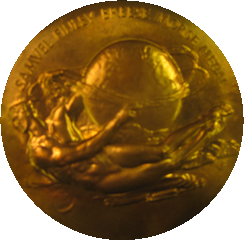 For these innovations to the field of geography, AGS created the Samuel Finley Breese Morse Medal in 1902. Unlike other AGS medals, the Morse Medal commemorates the innovation to the research of geography, as opposed to the physical exploration of new geographic frontiers.